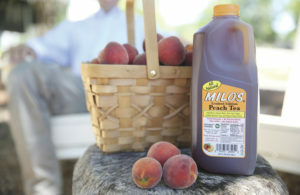 Milo’s has branched out in recent years by offering new flavors, including ever-popular peach. The company founded by Milo and Bea Carlton in Birmingham has expanded again, as Milo’s Tea Company moved 50 positions from accounting, finance, sales, marketing and administration to a second office in Homewood’s Lakeshore Park Plaza. Now a certified women-owned business, Milo’s will be a perfect fit in Homewood, according to CEO Patricia Wallwork, who praised the town’s amenities. The company’s Bessemer plant will remain the primary location for brewing, filling and shipping Milo products. “In 2018, we doubled our production workforce to meet increased demand. As we look to the future, we are excited to continue this significant growth and our new Homewood location provides much needed office space in an area attractive to current and future employees,” Wallwork says. Milo Carlton first brewed tea in his restaurant in 1946. Milo’s Famous Sweet Tea is now the number one selling refrigerated tea in the U.S. Milo’s products fill shelves in more than 13,000 retail locations across 45 states.